So, back in May, Fajita launched this idea of 40 Days of Fat - a tool to motivate us bloggers to better health and to donate to a specific cause. Some of you may have read back last October when I joined Weight Watchers. The original goal of joining was to lose weight before my sister's wedding. Well, I lost 20 pounds, but somehow stalled along the way and have been wavering around those last 5 pounds that I lost. I still weigh more than I want to and more than is healthy for me. So, I'm committing to join Fajita's 40 Days of Fat - Reloaded. Who's gonna get my money: New Friends New Life - a nonprofit organization (that originally began out of my church) that is an avenue to help women leave sexually oriented businesses. 3 - Overall goal is losing pounds, so $5 per pound lost. I'm going to keep a calendar of my progress and (hopefully) be able to publish my success here (at least the $$ totals). Care to join us?? So, I just discovered a new TV channel - OLN - the Outdoor Life Network. I am definitely not an avid Outdoor Life person, but I ran across it trying to find some coverage of the Tour de France. And today, I discovered a really fun thing - they are rerunning all the seasons of Survivor! I discovered Survivor kinda late in the game (I wrote about it back in February here), but I've absolutely become a fan. And now, I can go back and get caught up on the earlier seasons! Fun stuff. Had another great evening with the last of "the girls" tonight -- Dara finally made it to Texas! She, Katie and I went to dinner and then hung out at my apartment and watched "How to Lose a Guy in 10 Days." All of us have seen it so many times, but it never fails to make us laugh. Then I took Dara up north to her sister's place -- and now I'm off to bed! So, in my last post I mentioned my girls reunion weekend. 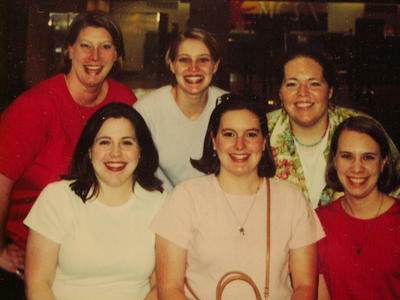 Back in 2000, we decided to have an annual girls weekend where all 6 of us would get together. Some years have been harder than others, but we've at least gotten several together each summer and we've actually had a few where all 6 of us were together! We even did a time capsule that first year, that we'll plan to open in 2025. So for this year's reunion, we were using my apartment as the location. Friday I got home from work, straightened up some, made a coffee cake for breakfast Sat/Sun and waited for the girls to arrive. About 6:15 I heard a knock on the door! We went to eat dinner on Friday night at my new favorite little mexican restaurant, Casita Dominguez (it is where I eat each Tues night with my Dallas mom, Martha). Then we went across the street to Half Price Books - but no luck looking for Christian CDs - so we headed up to Lifeway. Then we stayed up talking and laughing, telling stories and catching up on life. Saturday, Katie had to go spend most of the day working with her Student Council kids on FishCamp. Sarah B spent most of the day with her parents packing and reorganizing all her stuff for her trip back across the ocean to teach a third year at Faith Academy in the Philippines. So, Sara W and I vegged watching chick-flicks and went to eat lunch. After Katie & Sarah rejoined us, we ordered pizza and spent the evening watching some funny videos from our freshman year at ACU (Welcome Week and Freshman Follies). It was so fun. Then Sunday morning, we all got up, got dressed and ready and met Sarah B's brother Jason for the trip to the airport. We got her all checked in (thankfully her boxes were right at the 70lb limit!! ), cried a little, big hugs all around and then we left Sarah to wait for her flight. Then Sunday night, my friend Elaine was in town. She and I have been friends since 5th grade in Abilene. 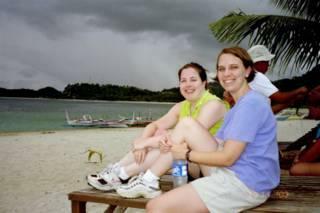 Right now she is working on her PhD in Marriage & Family Therapy at Purdue. One of these days I'm going to have to take a trip up there to visit her! But, this time she was in Dallas seeing all her friends that live here. We went to dinner and spent the evening catching up. Whew, what a night! And then this week has just been one busy thing after another. I'm cooking dinner tonight for my sister and brother-in-law. Should be a good time to catch up with them as well. Don't know how many of you, my faithful blog readers, are fans of Harry Potter.....but, I finished reading the Half-Blood Prince today!! I will not give any secrets away for those of you still reading, but I was really surprised by a couple of things in this segment of the story. I think I'm going to have to go back and re-read at least book #5 to remember where things stood, and then re-read #6. I think I've about got my new computer up and running -- it was a surprisingly smooth transition (at least so far!). And it was a good excuse to rearrange my desk and clean out a few things. I've got my college girlfriends reunion this weekend. Only 4 of the 6 of us will be able to get all together this year, but I went and visited my friend Mollie (lives in NM) last weekend in Abilene, and I'll get to see Dara (lives in CA) next weekend when she is in town for a Mary Kay seminar. So, I think I'll at least get to see everyone - even if we can't all get together in one spot this year. And the spot this year is my apartment! So much fun!! We'll have to work harder next year!! So, I'm in the middle of setting up my new computer. It came a week ago, but I've been so crazy busy and out of town that I barely had time to unpack it! It is amazing how much easier it was to set up than my last new computer (about 3-4 years ago, I think). Seems like the manufacturers are trying so hard to make computers user friendly for people that aren't tech geeks. I'm moderately a geek and remember being frustrated with my last computer setup. But this one was so easy! Right now, I'm waiting for a backup of my old computer to finish so that I can transfer all my files. Then, I'll work on erasing all my old stuff and get that computer ready to donate. Fun stuff!! I'm not sure if I have blogged about this before, but I do love to be a hostess - to have people in my home and to cook for them. It is one of the gifts that I have been told I possess - that of hospitality. Tonight was my first hostessing turn of Dinner Club - and it was a success, if I do say so myself. Total of 10 guests, plus me - 11 people for a home cooked dinner. Everyone was very complimentary of the entire meal, but especially my homemade spaghetti sauce (thanks Lacey for the recipe!) and the homemade fudge pie (although made with storebought pie crust, not scratch - I still haven't mastered that skill). The best compliment, though, is the very small amount of leftovers! And yes, mom, you were right, the spaghetti took longer to cook than I anticipated. For some reason, the only pot that would boil was the one on the big burner. And I only have one of those.....so, we sorta ate in shifts. But it worked. Dishes are done, dishwasher running - now off to bed! I have some friends at church that started a Dinner Club a while ago (I think it evolved from a bunch of folks that lived next door to each other eating out once a week). A few months ago, they invited me to join them as a "member." Here's the way it works: each Monday night a different member hosts the meal at their home. In return for preparing one meal, each member gets a bunch of free meals. I think there are 12-14 members at this point - sounds like a lot of people to cook for, but as is the way with all schedules, not every person can come every week. So essentially, you cook once, and spend the next 11-13 weeks having meals prepared for you! Tonight is my first night to host Dinner Club. As much as I love to host people in my home, I have not perfected my "sit down dinner for a crowd" skills. So, we are having the relatively simple dinner of spaghetti, salad, bread, and for dessert a choice of strawberry shortcake or fudge pie. Yum. Well, it had been a little while, but I had another platelet appointment today. Just gave a single, but that's okay - every unit helps save a life. E is for essential item to bring to a party: me, of course! N is for name of good friend: too many to list!! Q is for quotes you like: Friends are the family you choose yourself! I have been priviliged the past few days to host my good friend Sarah. She is one of my very best friends - she reminded me just recently that we've known each other for 12 years! Hard to believe sometimes. Of course, that's what makes our friendship so good - it is comfortable and we know so much about each other that even after we haven't seen each other for a while, we fall back into easy conversation. Sarah has been living in Manila, Philippines for the past two years teaching children of missionaries at Faith Academy. She came home for a visit this summer and has been making the circuit of Texas - visiting friends, family, supporters - and living practically out of her car (which I can imagine is getting pretty tiresome!). So, while she needed to be in Dallas for a conference downtown this week, she crashed at my place. It has been so fun to have her there - it almost felt like we were roommates again. I'll get to see her for another weekend before she heads back across the ocean and probably get to take her to the airport. God, thank you for friendships that are deep and abiding and can span the breadth of time and space! Ok, I still don't really get it. Maybe I never will.....but I do have a different appreciation for Nascar now. I watched parts of an E! True Hollywood Story on the sport tonight - I have no idea of its accuracy - but it seemed to give the perspectives and thoughts of a wide range of people involved. And it was very interesting. Still don't think I could sit and watch an entire race - but maybe if I was watching with a true fan that could explain things to me along the way? You know, all experiences in life are learning experiences - if we will open our eyes and look for them. I have written here before about my lack of experiences in the dating world - and how much I long for and desire a Godly husband and children. I wrote a couple of weeks ago about my trying to conquer fear and learning how to do this thing called dating. Well, tonight I learned that it is a good thing sometimes to just ask the question: "so what are you thinking?" Turns out that the guy that I have been seeing and I were both wondering the same thing. And we were both ready enough to know the answer to bring up the topic. It even turns out (God is funny this way sometimes) that we were really both in the same place. So, we aren't going to be "dating" anymore. And that is really ok with me. I know that this experience has opened my eyes to lots of things about dating and relationships that I knew intellectually, but hadn't really experienced before. I know that I learned quite a bit about myself and the potential pitfalls that I need to learn to avoid in the future. I know there is still much for me to learn. But, it really was overall a good experience. I just hope I remember some of these lessons the next time! I really love Saturdays. Especially lazy ones with not much planned. It was so great this morning to be able to sleep until I woke up. Although, my body decided to wake me at 5:30! I was able to go back to sleep and finally climbed out of bed about 9:00. It was great! straightened my entire apartment (little things mostly, like putting away all my shoes and taking out the trash). And it is only 1:30! There are so many more little projects that I want to do - like clean out/reorganize my hall closet. But, I think I'm going to kick back for a while and read and relax first! I might even go out to the pool, but I haven't decided about that yet. Then it'll be time to clean up and get ready for my dinner plans. Did I mention how much I love Saturdays? Hope you are all having a great day! I agree with most of this -- but my caffeine addiction of choice is Diet Coke, not coffee, so the low level might be a little misleading! Think I've done this before, but don't remember if I posted it or not! Read it again on Bobbie's blog and decided to post here. Looks like I've got lots of places to visit! I just love summer rainstorms. My favorite thing is a big thunderous, lightening flashing storm. But, I'll take rain any way I can get it....and if it cools off the Texas heat, that's even better! Over the past couple of years, I've been frequently in a melancholy/pensive mood. I don't really know what prompts this mood, and while it is not all together unusual for me, it has been more constant than other times in my past. More and more often, I have caught myself wondering ..... who is that girl reflected in the mirror? The perception that I have of myself is somehow different than what I see reflected there. Different how, I don't really know. But different. I see a more confident, serene woman in the mirror than I feel in my oft turbulent thoughts. I see green eyes staring back at me that (to my perception) are somewhat shadowed and hidden, not clear and open. I don't see the craziness that I feel when my thoughts tumble out of control and worries overtake my life. I don't see the beauty, confidence and accomplishment that others tell me they see. There is more that I see or don't see, but I can't really put it into words. But, somehow, the person in the mirror just isn't me. So, who am I, really? Who is this person that lives inside this body? This spirit? This heart? What is going on in my world? What am I supposed to be doing, thinking, feeling.....? (as if there is a "right" answer...) Am I doing what God has intended for me to be doing? Am I really following Him? Will I recognize His command? Am I ready to give up my will for His? Someone please tell me that these questions are not completely off-kilter and strange. That someone else has, at some point in their life, wondered some of the same things? And what did you do with those questions, those wonderings? What do I do with them? Please don't wonder that I'm spiraling off the deep-end -- I promise that I am not. I just get to thinking (far too often, probably) and this is an outlet to get some of those thoughts out of my head. I'm glad that it is Friday......It is always so much harder to catch up from being out of town than I think it will be. And when the out-of-town was overseas, it seems to compound the amount of time needed. Anyway - I'm looking forward to the long weekend - maybe I can get caught up on some sleep, if nothing else.